The way hotels present themselves and interact with guest and prospective guests on social media is critical in today’s increasingly digital world. It is important to have a voice and a presence where your guests are looking for information about your hotels or upcoming trips. As such, it’s also important to keep abreast of new social media features that might give your hotel an edge. By now, you may have heard of Facebook’s new 360 photos. 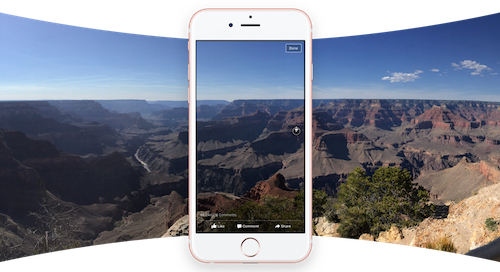 A 360 photo allows you to see the photo from every angle including above, below, behind and next to you, allowing you to create an immersive experience for fans on your Facebook page. Instead of being flat, the photo is much more inviting than a traditional photo, especially on mobile. Does your hotel have a unique pool with a swim-up bar or a great view from a rooftop deck? Show it off with an immersive 360 photo, so guests can get first-person perspective. If your hotel has a space for events like concerts, golf tournaments, and more, you can use a 360 photo to give your fans a look from inside the event or behind-the-scenes. By sharing a Facebook 360 photo, you give fans an opportunity to experience pieces of your event. If viewers are interested in attending the event, they now have a better idea of what to expect. Travelers don’t usually start with a hotel booking when planning a trip. In fact 82% of leisure travelers haven’t chosen the accommodation provider they will book with when they first start thinking about a trip. This is your chance to inspire your audience and show off unique attractions around your hotel. Think beyond the photos typically used in your marketing and show off local hot spots, historic spaces, or public art installations. On social media, it’s all about sharing visually engaging content that is valuable to your guests and followers. And, 360 photos are a great way to story-tell on Facebook with striking visual content.